Books and play are my two favorite therapy methods, so what could be better than combining the two? Sometimes people think that all SLPs do is play, so how hard could that be? They’d be surprised if they tried to accomplish specific goals in maybe an hour or so a week! 1. Kids who are engaged are more willing to learn. 2. 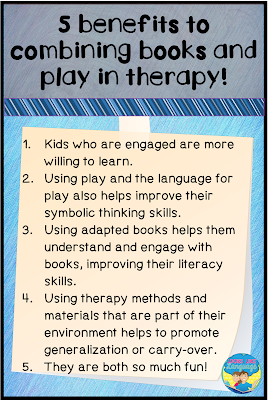 Using play and the language for play also helps improve their symbolic thinking skills. 3. Using adapted books helps them understand and engage with books, improving their literacy skills. 4. 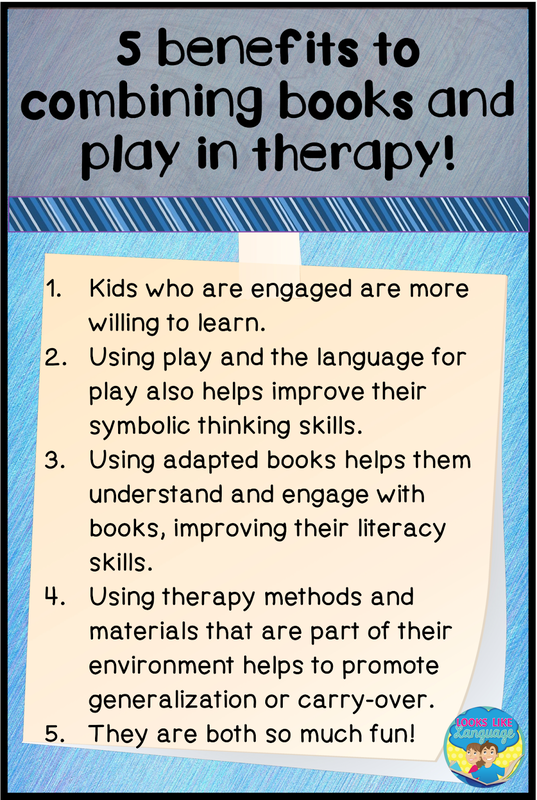 Using therapy methods and materials that are part of their environment helps to promote generalization or carry-over. 5. They are both so much fun! Spring is a fun time for incorporating a cloud/rain theme to go along with the saying, “April showers bring May flowers.” My favorite book to use for that theme? It Looked Like Spilt Milk by Charles G. Shaw. Did you know that there is a great website from the Baltimore City School system that has Boardmaker symbols for books all ready to download? For FREE! What a huge timesaver if you have Boardmaker already installed! Get the list of all of the adapted books here. Or you can start with the downloadable zip files, starting with the letter A here. Unfortunately, It looked like Spilt Milk used to be available, but no longer is. Maybe I should make that freebie for my newsletter members- what do you think? Since VISUAL DISCRIMINATION SKILLS are a must for any students using a symbol system to communicate, the shape matching nature of this book makes it a great choice to use with students who are developing literacy skills. Additional shape matching activities can be found in the book companion at my store. 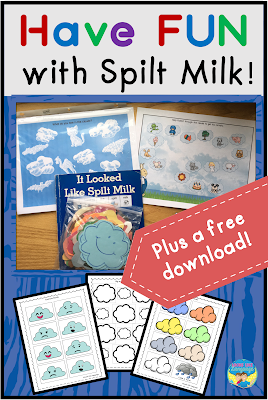 No worries, though, as you can just download the free cloud shapes here and do some old fashioned tracing and cutting on construction paper instead. Cloud faces with the basic EMOTIONS are always cute to use! Make a pile face down, elicit a target from your student and then let them choose from the pile. If you have 4 emotions, you can have 4 winners! Instead of picking randomly from a pile, stack each emotion in a deck and students can take turns requesting the emotion card they want. Clouds with different colors, sizes, and shapes add DESCRIPTIVE WORDS to their language! 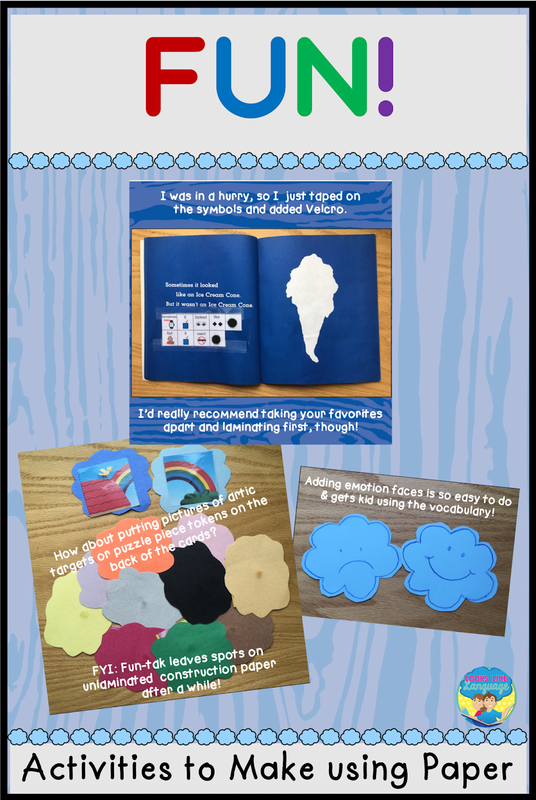 MIXED GROUPS- Try using tape or fun-tack to attach other pictures to the back of the cloud shapes. In the picture, I have pieces to a Sesame Street puzzle attached to use as a puzzle token board. The student knew that when the puzzle was completed, the task was done. 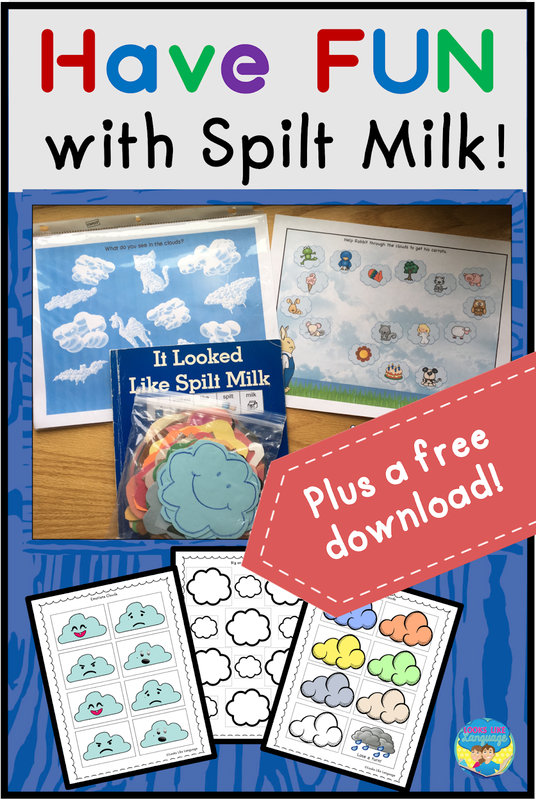 Give each student a set of their own clouds with their specific targets. Place the free cloud page that you downloaded in a page protector so students have to cover all of the shapes. 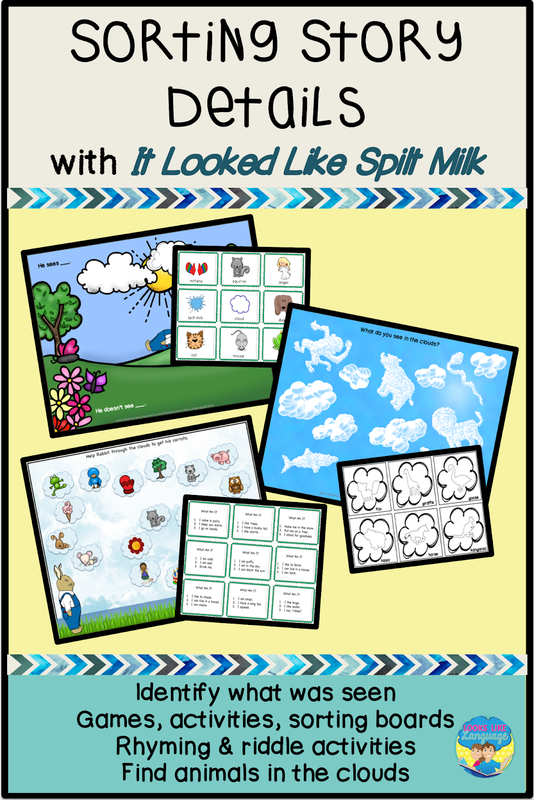 SPEECH SKILLS- Tape pictures with the target sounds on the back or write the word using a dry erase marker on the clouds if they are laminated. Easy! LANGUAGE SKILLS- It doesn’t have to be fancy. Just cut out the pictures from a worksheet that you can give for homework and tape them on the back to practice first! There are so many more fun activities in my book companion. 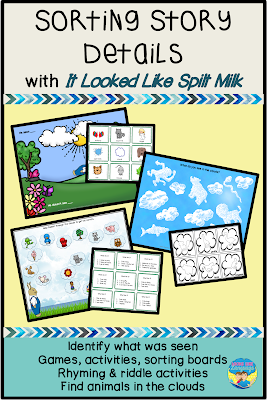 Besides giving little ones an easy way to start using the strategy of looking back in the text to recall story details, there are a cute open-ended game board, and rhyming and phonology activities, too. But I think my favorite is the cloud shape matching boards! Check it out here!